Translation: "Mom! How the heck can I speedily get on that double decker carousel over yonder?!" Me: "Look, Finn! Let's go ride that excellent carousel! You're gonna love it!" Translation: "UH-OH! What the Tally-Heck did I get myself into!? Gimme that pacifier that I also happen to call my Uh-Oh for some soothing emotional help here...DON'T let go of me, lady!" Is that the same carousel that was in Wes' production recently? How fun! 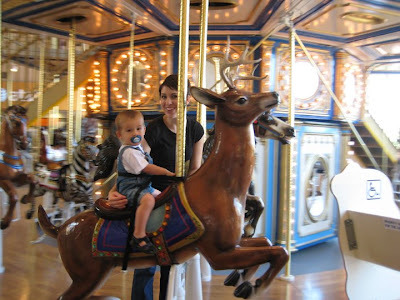 I take it this is his first carousel ride? Marvelous!